In a trade show environment, the perennial marketing challenge of “breaking through the clutter” is intensified beyond all measure. You’re a speck in a sea of like-minded competitors, all vying for the attention of the show attendees wandering (usually aimlessly) aisle to aisle and booth to booth. Whoever can attract prospects, get his message across and collect the most qualified leads is the winner. Success in this arena doesn’t take luck. It takes magic—the kind Seth Kramer provides for a variety of satisfied corporate clients. Seth has spent the past 25 years conquering nearly any condition you might face on the trade show floor. With more than 500 trade shows under his belt, Seth has the experience to stop and gather crowds while simultaneously delivering a seamless, customized presentation about your company and products. To learn more, click on the presentation style that best matches your needs. Corner-Aisle Presentations - Perfect for exhibits with the barest minimum, of space. It’s guerilla-style performing that delivers the goods. Small space? No problem. Our turnkey solution requires only a 4’x3’ footprint. 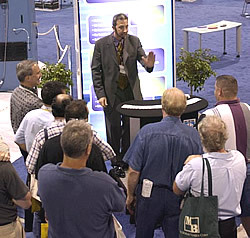 This gives any size booth the ability to add a dynamic, live presentation. Quick turnaround! We can customize a presentation for your company in as little as two weeks! One or two live presentations every hour keeps the crowds coming all day long. Theater-Style Presentations - Designed for larger exhibits (20x20 and up) so even more prospects can enjoy an information packed custom show. In addition to drawing record-breaking crowds, our Theater-Style Presentation gives your sales team additional opportunities to interact with the crowd, scan show badges, or collect detailed lead cards. These cards typically have your prospect’s name, company, phone number, address, and several pre-qualifying questions that help to separate the “tire-kickers from serious prospects. A post-show mailing adds further impact to your Theater-Style show, and ensures that your company will be remembered long after the show carpet has been rolled up. Add music, lighting and a Las Vegas Style illusion and transform your trade show exhibit into a trade show experience. Clients rely on Seth Kramer to present their businesses in the most professional light imaginable. So from the beginning, Seth immerses himself in your product’s information to such an extent that by the time he’s representing your company at the show, he’s “so well versed that he is often mistaken for a full-time employee of the company that hired him,” says Potentials in Marketing Magazine. One of the most effective ways of using promotional premiums at a trade show is to combine it with a professional live marketing presentation to attract customers to your trade show booth and deliver a targeted sales message. The item is then given to those attendees who have seen the presentation and have then been moved along to your registration area where their badge is scanned in exchange for your gift. We offer our clients a wide range of clever magic premiums that ties in perfectly with the magic presentation. Find out how to put Seth Kramer and his unique blend of magic and marketing to work for your company today.